Romance is in the air today with Cupid’s arrow ready to deliver a shot of love to some lucky individuals. Could the god of love deliver a jackpot too? 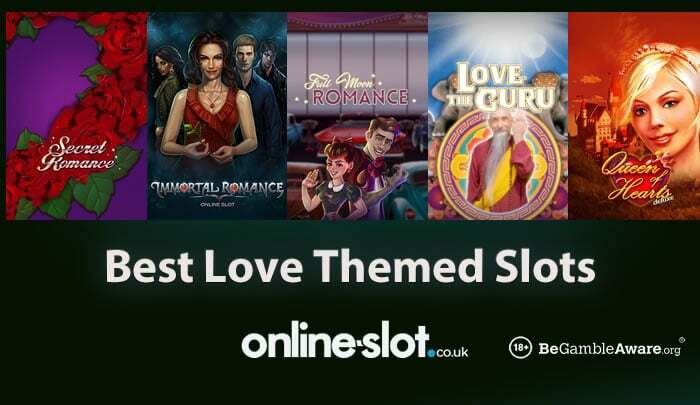 Here’s our pick of the best Valentine’s Day themed slots. If you like your St Valentine’s Day celebrations to come with a bit of bite, then that’s what you’ll find in Immortal Romance – a vampire/romance hybrid. Created by Microgaming, this 5 reel, 243 ways to win slot comes with a Wild Desire feature where you can benefit from up to 5 wild reels. There’s also 4 different free spins feature which reward you with multipliers, wild reels, rolling reels with multipliers up to 5x and a Wild Vine feature where symbols transform into wilds. It’s an oldie (first released in 2011) but still very much a goodie – you can win up to 12,150 times your stake on each free spin! There’s a definite ‘Carry On’ feel to Doctor Love, a slapstick, 5 reel, 20 payline slot from NextGen Gaming. The setting here is a hospital where Dr Love and his Love Meter can deliver some memorable action. The highlight here is the Free Games feature where you can win up to 40 free spins with all payouts trebled. This can lead to wins of 15,000 times your stake on every free spin – if you fill the reels with wilds. Take a romantic trip to the drive in enjoy a classic horror movie in Full Moon Romance. This super stylish slice of 1950s Americana has been created by Thunderkick and looks and sounds superb. There are some top features on offer in this 5 reel, 15 payline game too including stacked cloned symbols that can land on multiple reels. There’s a Bonus Game feature where up to 40 free spins can be won – the Clone feature applies where you’ll get stacked sweetheart werewolf symbols. Based on the 2008 movie of the same name, The Love Guru is a 5 reel, 30 payline slot from iSoftBet. As you’d expect from a high-profile branded slot, the design here is rather good and includes many of the stars from the film. The main extra is the Bonus feature. Hope to see wilds on the middle reel here as they fill the reels and lock in place for the rest of the round. The movie version of The Love Guru doesn’t really stand up to repeat viewing. The slot version is well worth a look though. The 5 reel, 10 payline Queen of Hearts Deluxe slot might not sweep you off your feet as far as design goes (it has been created by Novomatic after all) but it still has its charms. That’s largely thanks to the Free Games feature which awards 40 free spins and where Cupid can pull back his bow and fling multiple extra wilds onto the reels on each free spin. You can win 1,000 times your stake on each free spin. Rich luxurious design combines with some top extras in Secret Romance, a 5 reel, 15 payline slot from Microgaming. Joining the red roses, bottle of perfume, bouquet of heart-shaped roses, gemstone and masks for a masquerade ballare mystery red envelopes that transform into the same matching symbol. There’s also a Free Spins feature complete with super stacked mystery symbols and expanding multipliers that can boost payouts by up to 5x. You can pocket 6,000 times your stake on every free spin too! Join the Capulets and Montagues in this lavish re-telling of one of Shakespeare’s most famous plays by Pragmatic Play – Romeo and Juliet. Both Romeo and Juliet are walking wilds which shift across the reels when they land. They also deliver a re-spin. If they land on the same symbol position, they combine to create a stacked wild as well as triggering the Free Spins feature. On offer here are 25 free spins with the stacked wild locked in place. Romeo and Juliet – Yes, you’ve read this correctly. We have another slot based on Shakespeare’s ill-fated lovers. This one comes from Blueprint Gaming and as we’ve come to expect from this developer it comes with classy sound and visuals and huge raft of extras. They include 5 modifier extras that offer an assortment of wilds extras, 5 of a kind wins and bonus triggers as well as 3 feature rounds. On offer there are mystery win prizes, a pick me round and free spins. If you like plenty of variety, you won’t go far wrong here. It’s also part of the Jackpot King network with life-changing progressive jackpots on offer. Not in the mood for love/romance? We have detailed reviews of 1,000s of slots – check out our extensive Online Slots section for some inspiration.